TOWN retained the Halifax Saturday Cup with a smooth, no real frills performance in a match that saw six bookings and a red card deep into injury time. Ovenden defender Chris Gent, booked in the 10th minute, was not allowed to return to the field by local officials to collect his medal, standard practice under FA rules, after his dismissal which didn't even see a second yellow card from referee Phil Bolton. Town took the lead in the 41st minute through Wayne Gibson, Andy Kenton hit the second on 78 minutes and then ten minutes later "Gibbo" bagged his brace. 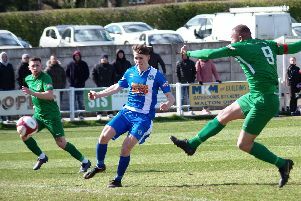 Ovenden, who came into the game on a goalscoring spree from the Premier Division of the Mumtaz West Riding CAL, were not in the same class as Town, whose football was of a far better standard. Town's three central defenders, skipper Paul Moore, Steve Worden and Tony Nicholson were in great form throughout. The two sides did, for the first 30 minutes, test each other out, but as the half wore on Town were getting on top and in the second half it was almost one way traffic. Ovenden skipper Kevin Megson, the ex-Halifax Town player, played his usual over-aggressive game against Brighouse, and he too went in the book in the 53rd minute after former Town skipper Mark Wood had been booked on the half hour. Town players Wes Dyson (56 minutes), Glen Lee (59) and Andy Kenton (61) also found their way into Mr Bolton's little book. Town were the first in action on four minutes when Glen Lee and Robert Barnes combined with Shaun Walsh, and then the leading scorer headed just over on seven minutes. A Mick Palethorpe cross gave anxious moments in the Town defence before Gent collected his booking for showing his studs to Walsh in a lunging tackle on the halfway line. Right wing back Lee Marsh was the only player really causing Town any problems and from one cross Ryan Brook gave Phil Brown, in the Town goal his first real bit of work to do. Andy Kenton, who was growing in confidence behind the front two of Gibson and Walsh, almost opened Town's account in the 19th minute but Richard Ingham just hacked the ball away as he was about to shoot past Ovenden keeper Lee Williams. Brook then cleared for a corner as Glen Lee looked for an opener in the 23rd minute. Five minutes later and Ovenden almost opened their account when Matt Calland hit a rising ball from just inside the box and Wesley Dyson cleared the danger off his own line. In what was now Ovenden's best spell Wood was just wide with a splendid effort before he too fell foul of the referee. Town did have the ball in the net in the 36th minute when Gibson fed Walsh, but he was judged offside. Ingham at the other end thought he had scored, so did the crowd, all watching from the South Stand, but it whistled past an upright. Then came the Town goal following a Glen Lee corner which had been cleared out of the box, Andy Moss banged it right back in and there to turn into the net was Gibson. Palethorpe, who was strong on the ball for Oveden, immediately responded but Brown turned it behind and 90 seconds into added time Walsh brought out a tremendous save from Williams and immediately on the restart the dynamic duo had Ovenden sweating again as they combined well only for Walsh to stub the ball agonisingly wide. Town were on top and Megson took out his frustrations on Lee and then Dyson was dragged into the indiscipline that has crept into the game before Palethorpe sent in a strong cross that was deflected for a corner. Lee and then Kenton went into the notebook in quick time before Brook was carried off and Ashley Shaw substituted. Walsh and Gibson again took play right into the Ovenden box and only poor finishing prevented a second goal. A Palethorpe free kick on 70 minutes had questions asked of the Town defence before once again Gibson brought the ball away from danger. Desperate for more penetration Ovenden brought on Lee Burrows for Marsh but it was Town who got the second when Walsh from the left gifted a pass to Kenton who almost blasted a hole in Williams' net. Ovenden brought on their third sub, Wayne Collins for Matt Calland and were then reduced to only nine men with seven minutes of actual time left as their best player Palethorpe hobbled off injured. With five minutes left Kenton got the ball in the net only for it to be disallowed, Walsh wasadjudged to have pushed a defender and then came the third goal to count, Walsh again feeding Gibson who made no mistake with the goal at his mercy.